Blankenberge ([ˈblɑŋkə(m)bɛrɣə]; West Flemish: Blanknberge) is a town and a municipality in the Belgian province of West Flanders. The municipality comprises the town of Blankenberge proper and the settlement of Uitkerke. 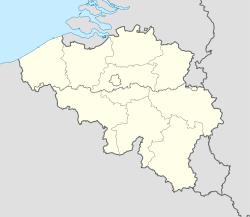 On 1 December 2014, Blankenberge had a total population of 19,897. The total area of the municipality is 17.41 km², giving a population density of 1,142 inhabitants per km². Apart from the sandy beach, there's a structure unique along the Belgian coast: a 350-m long art-deco pier, the Belgium Pier, constructed in 1933. Wing Commander Roy George Claringbould Arnold MiD RAF 29198 is buried in the CWG Cemetery Row A Grave 18. On 9 June 1941 Arnold saved the lives of his five-man Wellington crew from IX Squadron (including Flt Lt Dominic Bruce OBE MC AFM KSG MA the 'Medium Sized Man' of Colditz fame) by calmly staying at the controls of the burning plane to hold it steady while they baled out, in the certain knowledge that he would die doing so. Adolf Eugen Fick, physician and physiologist, died in Blankenberge in 1901. Frans Masereel, Flemish painter and woodcutter born here in 1889. Leo Van Paemel, artist born (and later buried) in Blankenberge. Rudi Pillen [nl], Belgian contemporary painter. Both schools have numeral different elementary schools organized by the same instances. Blankenberge railway station was opened in 1863. Trains operated by NMBS run towards Brussels, and the Kusttram run by De Lijn runs along the Belgian coast of the North Sea. Before the First World War, Blankenberge was an exclusive holiday resort frequently attended by Royalty. HIRH Archduke Franz Ferdinand of Austria and his wife HH Sophie, Duchess of Hohenberg as well as his sister HIRH Archduchess Elisabeth Amalie of Austria and her husband HSH Prince Aloys of Liechtenstein and his niece HIRH Archduchess Marie Valerie of Austria were regular holiday makers in Blankenberge. The Archduke enjoyed his walks to Wenduine and daily attended service at the St Rochus church. The Archduke and his wife were planning to travel again to Blankenberge after their last official engagement before the summer holiday at Sarajevo in 1914 where they were killed. After the First World War the Blankenberge police station was bombed by an unknown perpetrator. The blast killed 2 officers and wounded 2 others. After the Second World War it became a popular holiday destination. Blankenberg (so spelt) also figures in Phineas Finn by Anthony Trollope as the scene of a duel between Finn and another character, Lord Chiltern. The tenor Enrico Caruso attended Blankenberge for a performance in 1910. Since 1994, in August a couple of students from Minamiboso visit Blankenberge and live with families over here. Afterworth students from Blankenberge go and visit Minamiboso for eight days. This is organised by vzw 'Tweedaagse Voettocht van Blankenberge'. ^ "Two-Day Walk". International Two Day Walk. ^ Youngs, Kelvin. "Aircrew Remembered Aviation Personal Histories and Databases". ^ Manchester, Reading Room. "Casualty Details". ^ "rudipillen.be". rudipillen.be. Archived from the original on 13 March 2012. Retrieved 4 November 2012. ^ "Embassy of Japan in Belgium - Japan-Belgium Relations". Be.emb-japan.go.jp. Retrieved 3 August 2012. ^ fonzarelli (14 August 2010). "Blankenberge-Online-Persberichten". Blankenberge-online.be. Retrieved 3 August 2012. Wikimedia Commons has media related to Blankenberge. This page was last edited on 8 November 2018, at 04:39 (UTC).